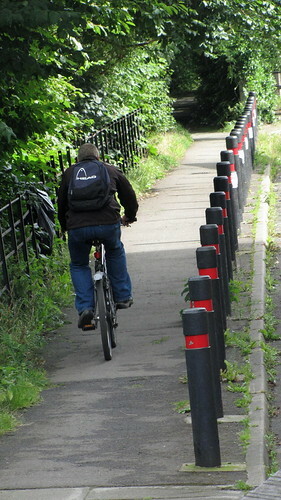 On investigation the accused was found in possession of tens of thousands of decent images of street bollards. 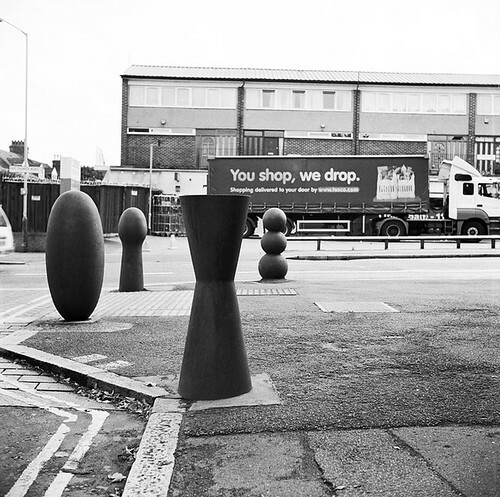 As the work connection blocks all flickr images, I'm pondering what could possibly be in six images on the theme of bollards. I'm leaning towards some kind of peculiar deviance, possibly involving a single cycling glove or similar placed on items of street furniture. I'm guessing the 'Ashy Path Concrete Two-angle Variable Pyramid' is your special favourite. 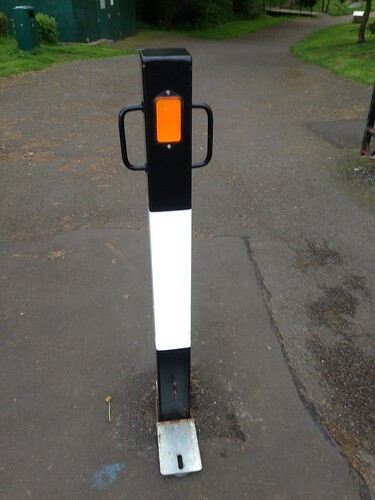 I don't think I've ever seen skillards in real life on a cycle path, just at the entrances to woodland paths, presumably as a deterrent to the bewheelèd. 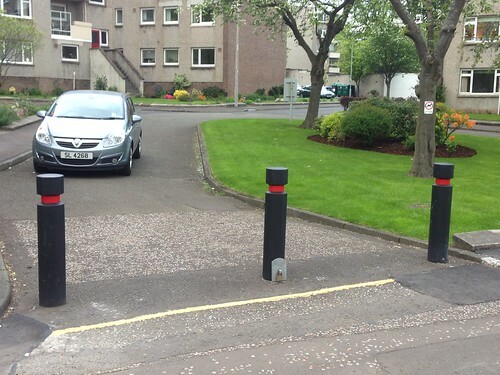 Fairly unusual "T" bollard on the bridge at Roseburn park just near the park entrance to Roseburn. 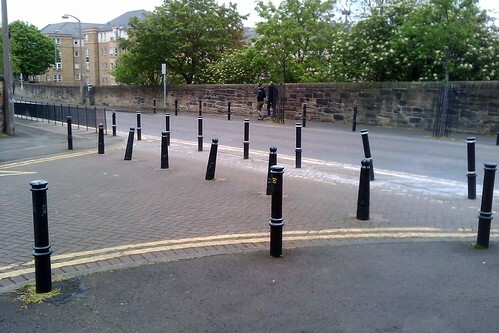 @arellcat are those bollards up from the junction of leith walk and McDonald road?mnear the good cafe Renroc and where the Zapatista shop used to be? Also post office sorting office. If so, they have been multiplying. 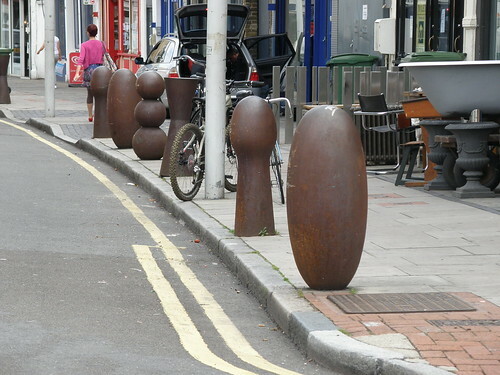 Wonder what the gestation period of a bollard is? Brunswick Road, corner of West Montgomery Place. Adjacent Edinburgh Autonomous Centre, Leith Walk Primary School, and across the road the site of the former GPO sorting office (RIP), now for sale after the 'soviet' flats plan was refused permission. 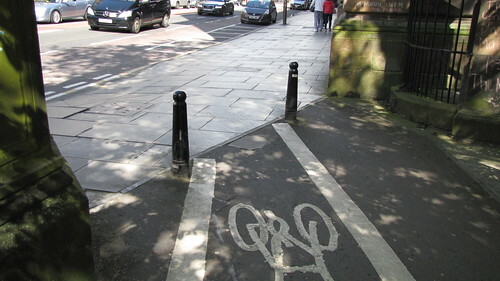 I cycle through these nearly every day. 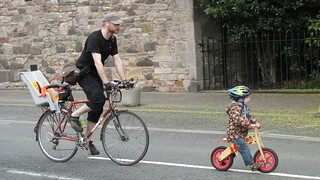 No problem even on the tandem. 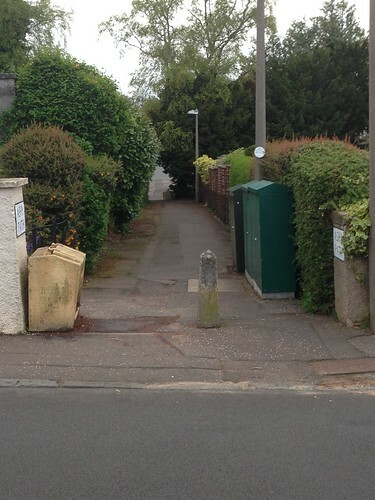 Dunno about a mobility trike, but I think I've had the big trailer through there a few times. 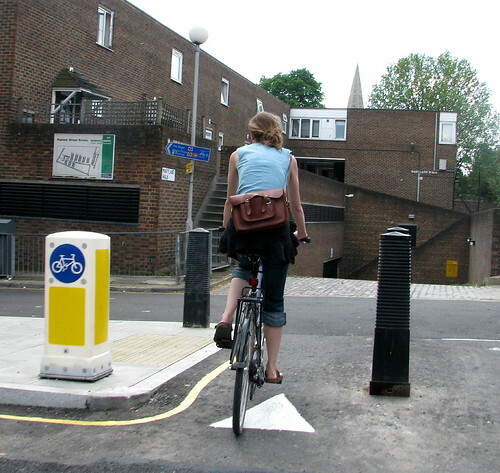 Bollards are better than chicanes, because they are generally permeable to bikes: you might have to slow to get through, but you can carry straight on rather than steer a dog leg around a chicane and risk falling over. @crow that is the place, Brunswick I could not get but knew brunstane was wrong. Soviet flats also rejected at our old office block at the other end of McDonald road due to most brilliant parent council submission I have ever seen, complete with naked man looking out into playground. Still only won by one vote. 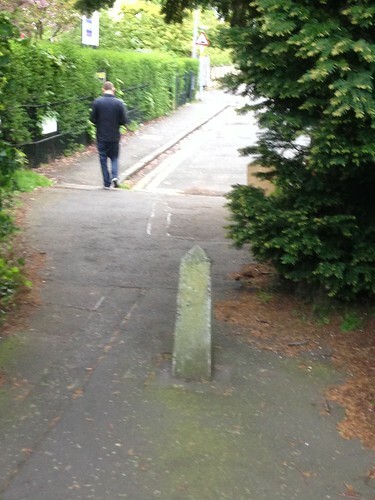 Generally one way (towards camera), though some people turn right onto (wideish) pavement. 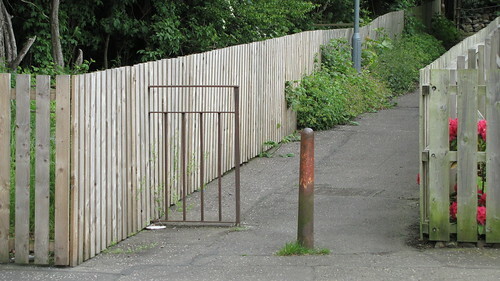 Vehicles access prevention, probably not much used by bikes. This is my favourite thread at the moment - at least the pics. 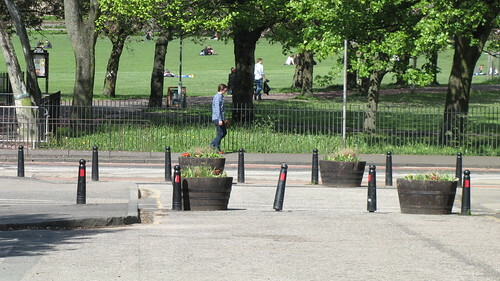 Don't know if planters are meant to have restrictive effect. 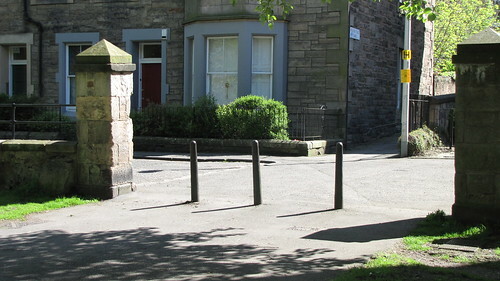 It is quite tricky indeed to get from meadow place onto the Melville place cycle lane. I do it occassonally and every time feel like I'm being forced out into the traffic. 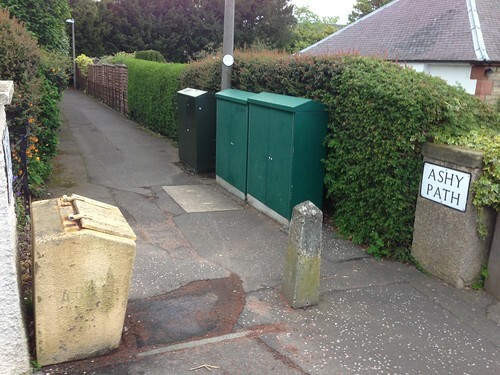 Two bollards have been taken out at the old globe span offices in colinton. They are building houses there. One looks to have been removed but the other has been sheared. 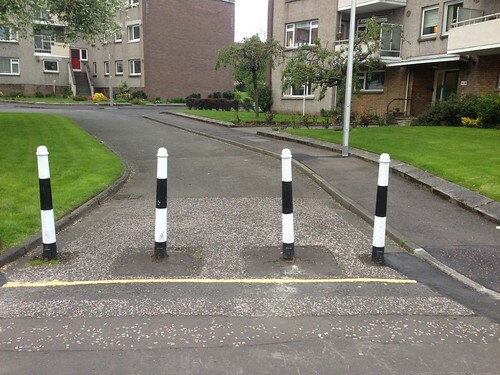 Would guess the builders did this by accident. Can drive a tank down WoL path now if you have a tank. 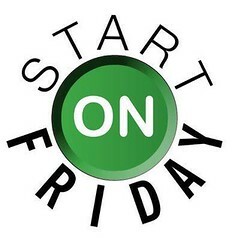 Will be time now for troops with or without rifles to be out jogging soon. 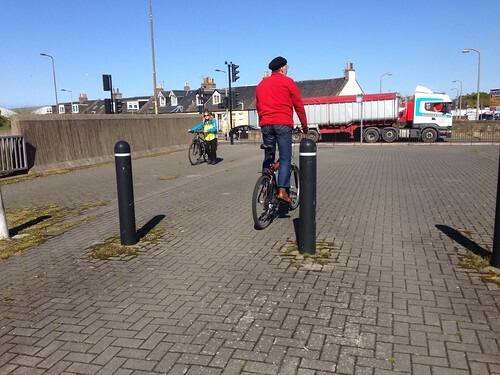 This last one has central bollard at end of path, plus a set of narrow and thicker bollards in middle of pavement, presumably to "stop" pavement parking, which has been endemic here on Dundee Street for years since the brewery closed. A couple of council tow-trucks one morning would net a profitable batch of fines. Vespa scootist driving across the pavement / around the bollards which close off Gylemuir from Gogarloch, at South Gyle station this morning. Can drive a tank down WoL path now if you have a tank. 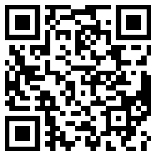 Remember to check the elevation of the gun barrel before entering the tunnel.